The Kübler safety control family Safety-M that was especially designed for drive monitoring has been expanded with new variants. Due to the additional safe inputs and outputs, even more complex tasks can now be addressed in the area of Functional Safety. The compact, modular Safety-M safety control system can monitor up to two independent axes simultaneously and/or in conjunction with each other. The devices are freely programmable for the safe processing of drive-related safety functions as well as of EMERGENCY STOP switches, two-hand operator controls, light barriers, operating mode selectors, etc. Complex motion monitoring tasks are also possible when both axes are combined. Up to two safe encoder connections can be implemented. 14 safe inputs, two safe analogue inputs and three safe shut-off channels are available. 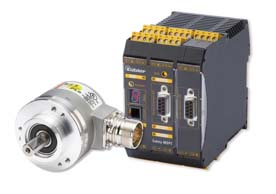 For safe speed and/or position detection 1-encoder solutions (for example, with Sendix SIL encoders) and, to a limited extent, 2-encoder solutions (a combination of any encoder technologies) are supported. The devices have a complete range of speed and position-related safety functions for drive monitoring acc. to DIN EN 61800 integrated in the firmware (e.g. SS1, SS2, SOS, SLS, SDI, SLA, SSM, SCA, SBC, EDM, SLT, SMT). The function-chart oriented Software SafePLC offers a comprehensive library for pre-configured safety sensors and command devices. The basic unit comes with 14 safe input lines and 3 cut off channels, comprising 1 safe relay output and 2 signal outputs. Moreover, the 4 analogue inputs allow for integration into complex environments. A notable feature is the cross-shorting monitoring. Contact multiplication or contact amplification by means of external contactors in conjunction with integrated monitoring is also possible. The encoder interface supports TTL, HTL, SinCos, SSI, resolvers und proximity switches. Simple operation is possible by means of a coded status display via the 7-segment display on the front and status LEDs as well as by the Quit, Start and Reset buttons also on the front. The modules can be expanded up to a max. 65 safe I/Os by means of the integrated backplane bus (connector can be snapped on to top-hat rail). Expansion modules with up to 8 relay outputs allow, for example, for safe electronic cam switches. Optional field bus interfaces (bus modules for PROFIBUS, PROFINET, CANopen, EtherCAT and DeviceNet) permit integration into existing networks.